Talk of God, of Jesus, and of the Saints may diminish, but the subject of angels always manages to capture popular imagination. They have a commonly understood form (a person with halo and wings) and so are not too abstract, yet they are ethereal enough to remain mysterious. These conditions are ripe for idle speculation. In Orthodoxy, however, the purpose and even form of the angels are not the result of imagination, but revelation. Their depiction in icons reflects this revealed teaching of who the angels are. Now, compared with us, the angel is said to be incorporeal (bodiless) and immaterial, although in comparison with God, Who alone is incomparable, everything proves to be gross and material – for only the Divinity is truly immaterial and incorporeal. There are many other articles on line which deal with the orthodox teaching on angels, and I include a few links below, including The Celestial Hierarchy, attributed to St. Dionysius the Areopagite, who puts forward the most detailed and influential teachings on angels. The above is enough of an introduction to the subject here, which is specifically angels in iconography. In The Celestial Hierarchy, St Dionysius derives nine ranks (or angelic choirs) from Scripture into which the angels fit. Listing the nine ranks here is not important, as not all of the different ranks are commonly depicted in icons. In addition, whilst no Church Father denies Dionysius’ classification – and many affirm it – other Church Fathers admit that the nine ranks may only be those that have been revealed to us, and not be a “complete” list. The reason for bringing up the angelic ranks is to say that angels and bodiless powers are catch-all terms for heavenly beings which are quite different from each other in terms of role and appearance. The role of an angel is defined by its proximity to the throne of God, and it is the proximity to the throne of God that forms a natural hierarchy. Now onto the different appearances of angels revealed in this hierarchy. The form, function and position of the Seraphim were revealed to the prophet Isaiah who ‘saw the Lord sitting on a throne, high and lifted up, and the train of His robe filled the temple. Above it stood seraphim; each one had six wings: with two he covered his face, with two he covered his feet, and with two he flew. And one cried to another and said: “ Holy, holy, holy is the LORD of hosts; The whole earth is full of His glory!”‘ (Is 6:1-3). The name given, seraphim, is Hebrew and means “burning ones” (plural; the singular form is seraph). They are the closest to the throne of God, and as such are flame-like, “For our God is a consuming fire.” (Heb 12:29); “His throne was a flame of fire” (Dan 7:9); “the appearance of the Lord was like a blazing fire” (Ex 24:17). The seraphim, then, are usually painted in icons in red, signifying this flame. The six wings are arranged in a particular way: two pointing down (covering the feet), two up (covering the face), and two outstretched (in order to fly). They are also frequently found surrounding images of Christ in glory. In the 14th century fresco by Theophanes, the Seraph is shown holding a flabellum or hagion ripidion (lit. “sacred fan”) upon which are the words “holy, holy, holy” in Greek: the same thrice-holy hymn used in Isiah’s description of these angels. The first record of man’s interaction with an angel of God comes in the Book of Genesis, after Adam’s temptation and fall. Driven from Eden by God, Adam and Eve are prevented from returning by cherubim placed to guard the gates with a flaming sword (Gen 3:24 – see also this mosaic of the scene). So much for the post-Renaissance inspired image of the cherub as a cute baby with wings! In Hebrew, Cherubim means “great understanding” or “effusion of wisdom”, and are so described because of their closeness to God: the Lord is described as dwelling “between the Cherubim” (2 Sam 6:2). Because of their proximity to God, and the description of them guarding Eden with “flaming sword”, the cherubim are, like the seraphim, often depicted in a fiery red. Nevertheless, they can also be depicted in greens or blues; the former is the colour of the Holy Spirit and spiritual growth, the latter the colour of the heavenly realms. The cherubim are also often shown as all-seeing with numerous eyes on their wings, relating to the aforementioned “effusion of wisdom” revealed by their name. It is worth noting that in the Old Testament figures of cherubim decorated the sanctuary, by the decree of God Himself. A pair of cherubim made by gold was ordered to be placed on the mercy seat and between them the Lord spoke to his people (Exodus 25:17-22), and figures of cherubim were woven on the veils of the tabanacle. Therefore a revealed image of the cherubim has been passed on to Christians, which is still used today. An image of the cherub not passed on from the ancient Christian faith is that of a young, chubby, infant with tiny white wings. This image crops up in Italy during the Renaissance and is wrongly named a cherub, spreading throughout Europe, and even influencing a minority of Orthodox icons in the 18th and 19th centuries. In fact, these chubby winged babies are actually called putti. Who are “six-winged and many-eyed”, the cherubim or the seraphim? 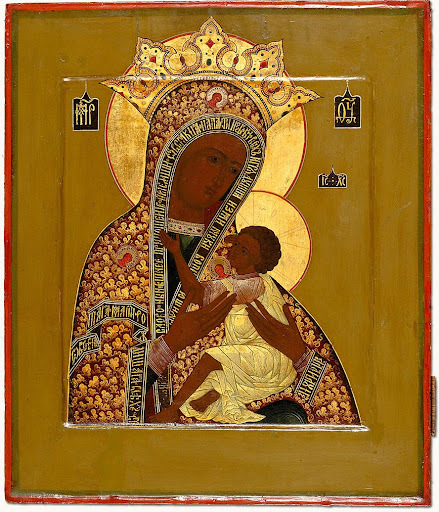 Orthodox iconography reveals to us: both! Seraphim are also sometimes shown with many eyes on their wings, whilst cherubim can sometimes be shown fiery-red and “six-winged” but without eyes (for practical purposes). This is because the meaning of the fiery-red colour and the multiple eyes signify something which is true of both seraphim and cherubim. Inscriptions on icons reveal whether a seraphim or cherubim is being depicted. The thrones are described as “God-bearing” since on them, as on intellectual thrones (as writes St Maximus the Confessor) God intellectually resides. They are not God-bearing by nature, but by the grace of God; therefore, like all the names of the celestial bodies, Throne describes this particular rank of angel’s function more than its nature. one wheel upon the earth by the living creatures, with his four faces. The appearance of the wheels and their work was like unto the colour of a beryl: and they four had one likeness: and their appearance and their work was as it were a wheel in the middle of a wheel… As for their rings, they were so high that they were dreadful; and their rings were full of eyes round about them four. The “living creatures” Ezekiel described are a type of angelic being – sometimes thought to be a type of cherubim, but commonly known in Orthodoxy as the Tetramorph. The tetramorph is also shown in the icon surrounding Christ at the top of this post. As for the “wheels”, in Hebrew these are “Ophanim”, another name for the Thrones. These angelic beings are rarer in iconography than the seraphim and cherubim, but where they are shown they are usually the “colour of beryl” (white, with highlights of the already oft-mentioned “fiery red”), many-eyed, and with wings to denote their swiftness; they are also shown at or around the feet of Christ (in the icon at the top of this page they are shown around a footstool). The fiery ministers of God described above are common enough in Orthodox hymnography and iconography and their form is well-known, yet their appearance is not that which immediately comes to mind when we hear the word angel. We tend to think first of a winged-man, and this form comes from what has been revealed to us regarding the Angels and Archangels. Although all the bodiless powers are known as angels (because they are all messengers), the name is specifically given to the “ministering spirits” at the bottom of the celestial hierarchy, i.e. those closest to Man. These angels appear throughout Scripture – indeed throughout history – to people, to bring messages from God, to guide us, and even to protect us. With so many recorded manifestations, a general appearance of an angel is formed: a youthful man, often with a light-bearing countenance, frequently wearing white robes. St John Damascene says that the angels “do not appear exactly as they are to the just and to them that God wills them to appear to. On the contrary, they appear under such a different form as can be seen by those who behold them” (Exact Exposition). Therefore we can say that the revealed image of the angel, like the name, tells us more about their role than their nature. As Dionysius writes, they are depicted “under the likeness of men, on account of the intellectual faculty, and their having powers of looking upwards, and their straight and erect form..” and “the figures of manhood and youth denote the perpetual bloom and vigour of life”. And so, whilst angels themselves are not divided into “male” and “female”, they always appear in Scripture and in Icons as young (beardless) men. Statues and images of angels as young women with wings appear only much later in churches, and are not based in Christian tradition. In all the divine revelations of angels as young men, they are never described as having wings. Indeed, the earliest depictions of angels in the first centuries of the Church show them as wingless young men in white robes. Nevertheless, it is now common to show angels with wings. The wings can be understood in the same way as halos. Halos on Christ and the Saints (and also on angels) are not photo-realistic, but symbolize the holiness of the subject, a holiness which is undeniably real. The wings of the angel symbolizes swiftness and “the lightness of the wings denotes their being in no respect earthly, but undefiled and lightly raised to the sublime” (St Dionysius, The Celestial Hierarchy). The wings also indicate the relationship of these beings with the Heavenly ranks of the Seraphim and Cherubim, which in Divine revelation are indeed shown with wings. The Divinely-revealed appearance of the Heavenly Powers is to be found in the meaning of their names, their descriptions in holy Scripture, and their depictions in iconography. It can be seen from the above that for all the vivid appearances of angels to men, such revelations only show us how these beings relate to us, and how they can bring us closer to God. Beyond this, looking at their innate nature, little has been revealed. And as Dionysius says in the conclusion to “The Celestial Hierarchy”, anything regarding the Heavenly that hasn’t been revealed by God can only be “honoured by silence”. We are left, then, with distinct forms and images of the Heavenly Powers which teach us that around God and around us are innumerable created spirits which reveal the things of God to us, guide us, and protect us from harm. Recognizing the need for all the divine help we can get, Christians direct honour and supplication to the divinely-revealed images of the angels. And to the knowledge of Your unapproachable glory. Concerning Angels, taken from An Exact Exposition by St John Damascene; quoted in this post. The Celestial Hierarchy, by Dionysius the Areopagite. This entry was posted in History, Iconography and tagged Angels, Archangel Michael, Cherubim, Dionysius the Areopagite, Seraphim, The Celestial Hierarchy. Bookmark the permalink. I have seen a few icons of Theotokos where she has faces on her robe where the stars are. Sorry for replying so late, but the truth is I didn’t know the answer to your question until today, when I happened to stumble upon an icon as you describe it. Thank you, I have seen this icon for years and could never find the explanation. Puzzle solved. Where can I get a copy of the very first icon? The one with all the Angels ? IS there a bigger image of it , that way I can print it. This is simply the best article I have read on the subject of Angels on the web. It was clear and concise. There is much confusion out there about angels, even in the Orthodox Church. May I put a link to this page on my page on the mosaic of the Seraphim from Hagia Sophia? You are welcome to link to any page on here that you like. 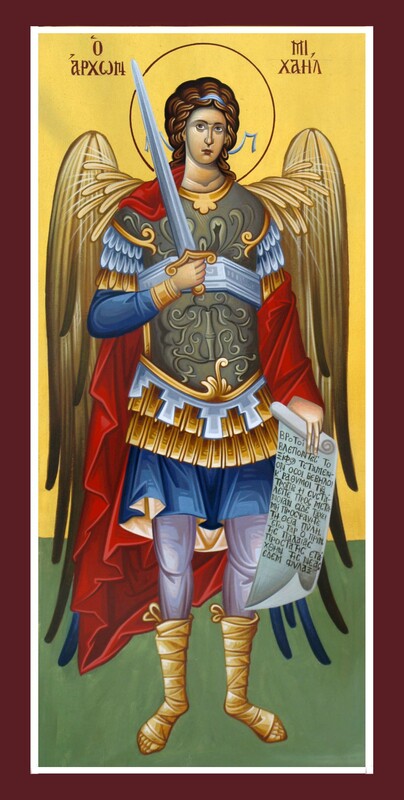 Do you know why icons of Guardian Angels frequently depict them holding a Cross and a sword? I was wondering do you know what the purpose/importance of the two strings that hang on the sides of the angels’ heads is? The two strings are a ribbon worn in the hair to keep longer hair in place. They are similar to cloth head bands worn by athletes in antiquity and, later, as crowns for kings (before evolving into metal crowns). Often, royal attire was reserved for the emperor or the closest of his servants or bodyguards, which would fit with the angels’ heavenly role with regards to God. The symbolism of the ribbons around the angels’ ears is to symbolize their attentiveness to God’s word. They are often “flying” around the head of the angel to give an impression of their swiftness (along with the wings). Thank you and please forgive.